Another week, another lame trip to The Edge of Extinction. I’ve given up on hoping there would be something somewhat dangerous there. But Reem? And now Keith? It’s really unappealing watching these two stumble around the island. It makes you wish for a falling boulder (Lord of the Flies) or at least a threatening smoke monster (Lost). But alas, instead Reem says she needs to be there (in a motherly role) for newly-arrived Keith but instead proceeds to whine when they find a map because looking for the location on the map seems too hard and getting there seems even more difficult. When they finally find a stairway it turns out to (surprise) not lead to heaven but instead to a tree holding a bucket of rice. At least some rice. A small amount of rice. Because on Edge of Extinction they’ll have to earn it by hiking up “Mount Everest” (as Reem calls it) every time they need rice. Back on the main island, it’s reward challenge time, and Jeff (adorned in a green hat this week) announces a challenge that could very well be sponsored by the National Wheelbarrow Association. It involves assembling, disassembling, reassembling, re-disassembling, and using wheelbarrows in several different ways until you finally create a slingshot to shoot sandbags at targets. After falling behind in the initial wheelbarrow assembly station, Kamu falls short, so for the first time this season Manu wins something. They get a choice between “comfort” (which seems to be a series of decorative pillows from the “heading to college” section of Bed Bath & Beyond) or a KFC special (three chickens and a rooster) and they choose the live poultry, presumably to either eat or collect eggs from as the season goes on. But alas! All is not well when they return to camp: Wendy, who is neither a vegan nor a vegetarian, but someone who admits she eats chickens from stores back at home, is aghast at the thought of eating chickens on the island! Wendy says it was her goal if she ever came on Survivor to free chickens and asks Rick to help her, but Rick refuses to be part of the plan for the time being. While other tribes in Survivor have waited to check the egg production of the chickens, this tribe is pretty hellbent on eating at least one chicken within 24 hours, which escalates Wendy’s plans. (It also begs the question how much “food” you can get from one rather small chicken, but apparently an entire tribe of hungry people has decided one or two bites of chicken is better than staring at a chicken in a cage). Back at Kamu, the tribe has formed a mega-alliance against the two veterans, so Aubry and Joe seem to be in trouble. Aurora has joined the returning players, so one of the three would likely get voted out--but we don’t spend much time with them, so we don’t have to worry that they’ll actually lose the immunity challenge later. 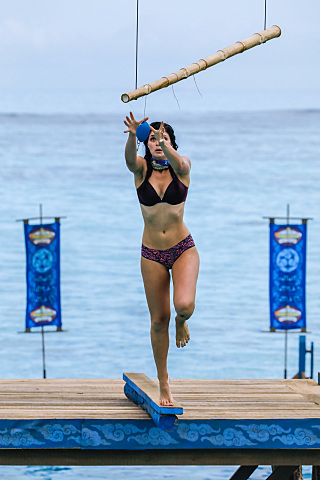 We do see Aubry finding a hidden immunity idol! She breaks into tears at this moment (which seems to be a sappy lifetime achievement-type accomplishment for her) and I guess we think… it’s good? Eh. I guess. But even she’s been rather bland this season, so let’s hope we get some more attitude from her now that she’ll feel more confident in her safety. Meanwhile, Wardog continues to become angry at Wendy because she has “lost her rocker” for wanting to free the chickens. In a caveman-ish argument he says “to win we need strength and to have strength we need food.” He doesn’t seem to have a reason why the other tribe has, without Popeyes or KFC or Chick Fil A, has won every immunity contest so far. The immunity contest has arrived and it’s yet another water contest (you can hear Keith screaming “nooooooooo” at Edge of Extinction) involving tethering members of your own tribe to a boat that’s pulled by the rest of the tribe (like a sleigh) in the water, jumping off platforms to get keys, and assembling a puzzle that makes a captain’s wheel. After a few minutes, it turns into a rout, with Kamu winning. Again. Not only did Manu lose the contest, they lost their flint! (Not really, though, because Wendy stole it!) Her theory, in an apparent transitive property of Survivor, is no flint = no fire and thus no fire = no chicken cooking. The tribe wonders if she stole the flint (or they just misplaced it) but she convinces them she doesn’t have it. While it first appears they’ll vote out Wendy for her overall weakness and chicken adoration, David realizes this is a great week to vote out fellow-veteran Kelly. He tries to convince his ally Chris and tells him don’t tell anybody, but Chris tells other people and in a funny twist, it makes the tribe mistrust him. At tribal, Jeff gives the most illuminating sound bite of the night: “A tribe that seems to have nothing going on but loss after loss after loss, right now seems to be playing a very complex layered game only 8 days in!” Maybe, although that’s giving them too much credit, Jeff. 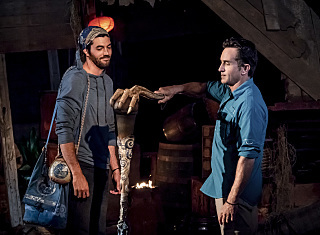 The tribe decides to send Chris home, although of course, with the Edge of Extinction twist, Chris reads the sign offering him to return to the game and says, “Screw those guys. I’m getting back in the boat.” He may be a bit more interesting to watch than Reem or Keith, but we’re only improving incrementally. The good news is it looks like a tribe switch is coming next week and contestants will be re-sorted into 3 tribes! That’s something to look forward to! More importantly, expect more chicken drama!